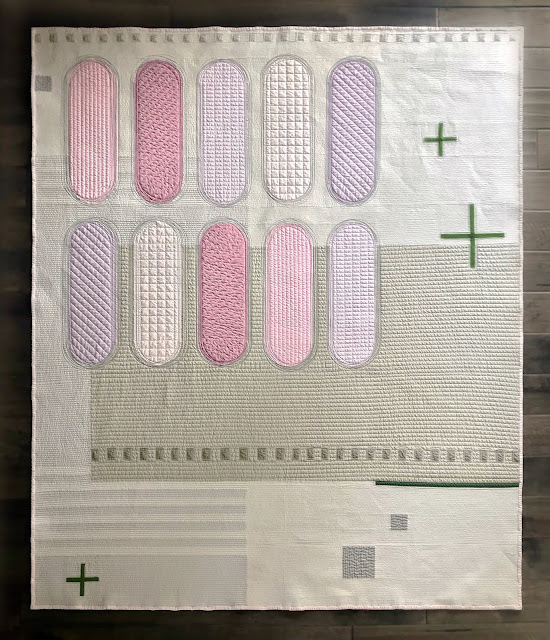 When I was at Quiltcon, yes way back in February, I saw several transparency quilts and made a note to myself that I needed to make one of those, (here's a link to the MQG's Quiltcon 2016 gallery). So, back in May I made one, yes May. 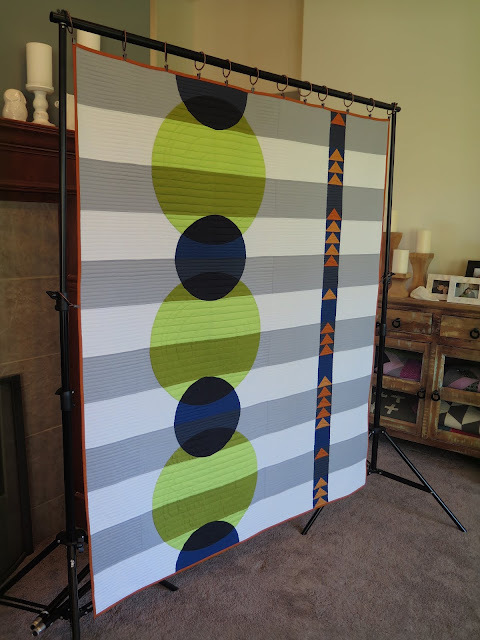 It's not the typical transparency quilt because I wanted to stay true to my geometric bold designs. 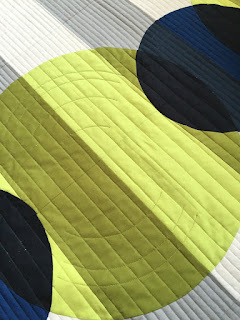 There is a sneak peek of this quilt in on the Show Entries page but the reason I didn't share details about this quilt before is because I submitted it to the Quiltcon Magazine. It wasn't accepted and in the end I was very pleased with that. I had some pretty serious sewing/writing going on at that time and I wasn't looking forward to trying to write a pattern for this quilt. I'm not even sure I could explain the block to myself let along write it down so others could understand it. Look at how crazy that block is and there there 4 different blocks in 2 sets of mirror images! It was super fun problem solving the piecing for this quilt and when it actually worked out it was so exciting. Somehow I missed taking a picture of the back for this quilt but I used Cotton and Steal, of course, Bluebird Flock in Indigo. I love the theme of the flying birds with the airiness of the transparency. Finally I named the quilt Optics with the idea of playing off of light refraction and layered transparent materials. 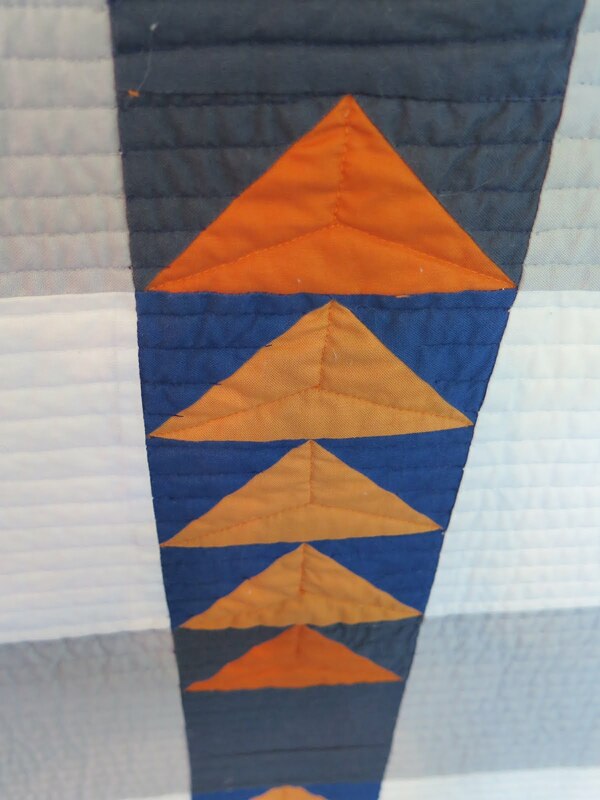 The quilting was done in a way that it looks like the quilt lines are being magnified. 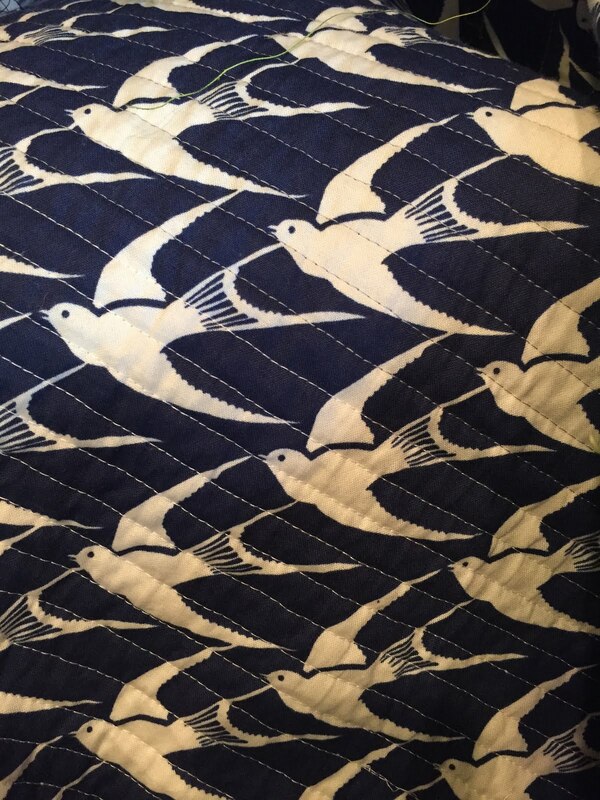 The orange geese on the right are quilted to look like gems that the light can't escape. It maybe didn't come across as perfectly as I wanted but I like it. Unfortunately, I haven't had too much quality sew time the last month or so. I'm hoping to get back into the swing of things after Christmas. There are several quilt patterns in the queue that I can't wait to get started. I'm debating about picking one for a magazine submission but I haven't decided yet. I think I'm too busy right now to commit to writing a pattern and making any quilt from start to finish. Hopefully I'll be able to sneak another post in before the end of the year but just in case I wish everyone a Blessed and Merry Christmas! 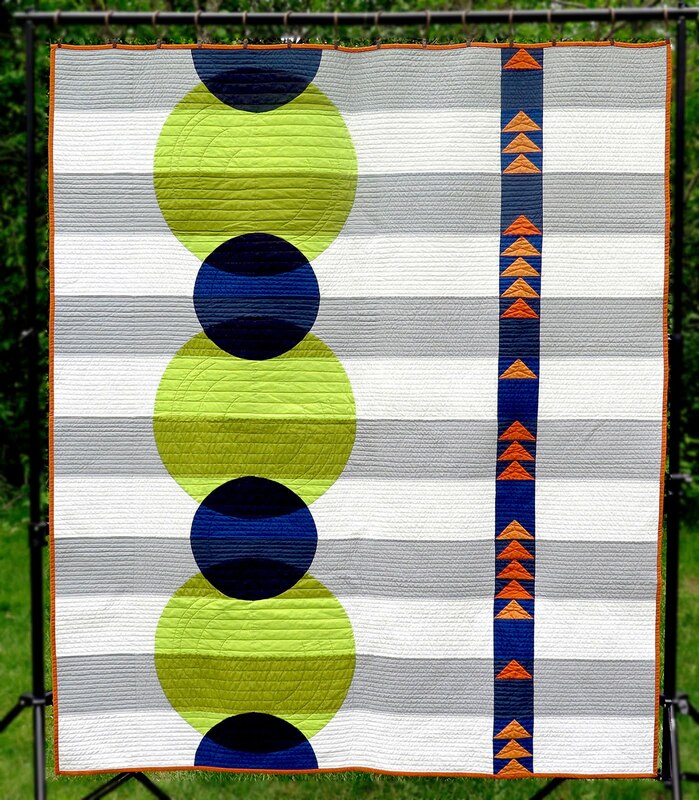 Optics Quilt 60 x 72"
This is really stunning. Transparency is so interesting when created in a quilt - something I'm not really comfortable yet - but certainly can appreciate. Nicely done! Thank you Debbie 😊 The key is in picking the colors. 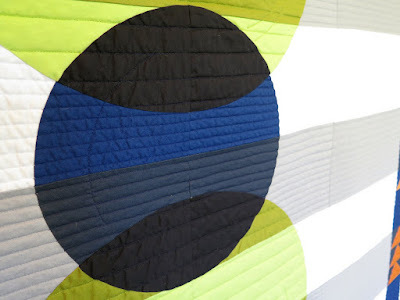 I've seen some pretty amazing transparency quilts using prints too... I know that's out of my league. Thank you for posting this - I absolutely love it and am in awe of your skills and talent. 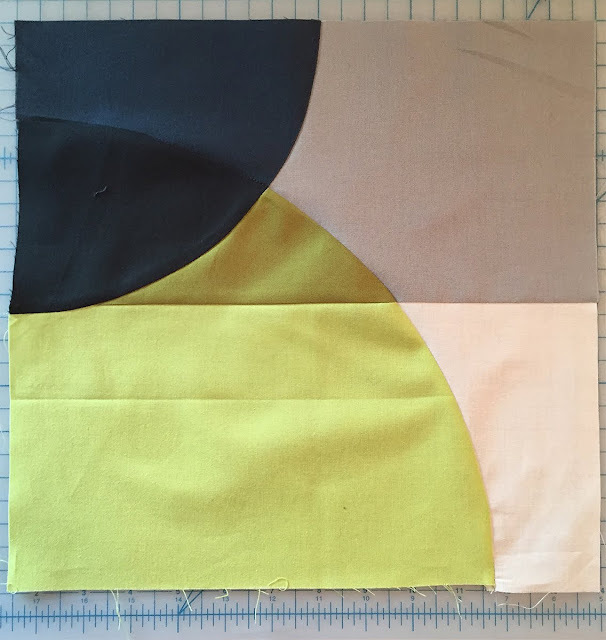 I've been wanting to try a transparency quilt for years and always stall at the fabric selection stage. 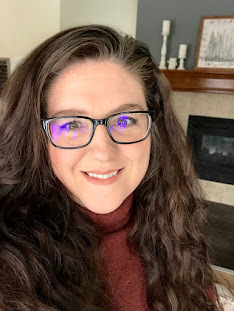 Thinking waaay back, it was seeing a transparency quilt on twitter around the time of the first QuiltCon that I REALLY got excited about quilting. I'd love to take a class on it! Thank you! You totally should! It was pretty fun. I chose solids to make it less complicated then just thought through the colors like I was placing transparent plastic films on each other. It definitely took some thought but it was fun.